How to become a novice? Which discipline are novices liable to observe? Who are they? What is their duty? What is the origin of this status? This chapter give all the procedure to become a novice. 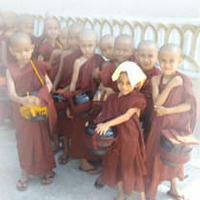 Very often, in countries hosting the theravāda tradition, we see children taking the robe of a sāmaṇera (Pali word for "novice") while the sole aim of finding themselves amid a large number of friends, to lead an easier life (as certain monks, besides), or because their parents put them into a monastery to feed up a sentiment of pride within the family or hoping that it will bring them good luck. Theoretically, a sāmaṇera is someone who wishes to take some distance from mundane existence, and owing to this fact, makes the choice to practise the dhamma in a way or the other, but in a deeper way than the one a lay life allows him to. Such a person is in search of a life environment enabling him to train, under auspicious conditions, into detachment, development of virtue, concentration, or more directly, wisdom. To do so, monastic life, in the way Buddha did establish it, proves to be the most appropriate alternative. Boys who wish to experience this life style, but who still didn't reach the required age for integrating the saṃgha (at least 20 years old, from the moment of conception), or who do not want to compel themselves into following the many rules and procedures of the vinaya, can just content themselves into taking the precepts of a sāmaṇera. Only a nun (bhikkhunī) is entitled to give novice precepts to a girl (sāmaṇerī). As the order of nuns have become extinct, sāmaṇerīs can ipso facto no more be. If nowadays a girl wishes to do the experience of monastic life, she can however take the 8 precepts of a nun (sīladhāra) and observe 8, 9 or 10 precepts, or even more. Some nuns go as far as observing the vinaya of bhikkhunīs (or partly), or some dhutaṇgas. A novice is therefore a person training into renunciation, living along with the saṃgha, who, like monks, wears the reddish or ochre robe (according to the regions) and shaves off his head. However, the code of discipline that he is liable to observe is far less elaborated than the one observed by monks, as for most of it, it is confined within 10 precepts. Remark: As only a sāmaṇera can integrate the saṃgha, anybody wishing to become a monk (bhikkhu) must necessarily and in a preliminary stage take the precepts of sāmaṇera. At the time when Buddha and his teaching started to be known, many young monks sprang up within the community, and among them, some children. Owing to the young ages of the later, and consequently their incapacity to conveniently lead such a life, many problems took place. For this reason, did Buddha lay down a rule (the pācittiya 65) forbidding the monks to integrate a person ageing less than twenty years within the saṃgha. Later on, when Buddha paid a visit to his family, he took his son Rahūla in his community while asking from one of his disciples, Sāriputtarā, to proceed to the integration of the former. Sāriputtarā inquired from Buddha about how to proceed, given that the Awakened One did not authorise a monk to integrate a person having less than twenty years of age, as Rahūla was only seven years old at that time. From that time onward, did Buddha accept, within the saṃgha, persons being less than twenty years old. They however enjoy a "more limited" status. Thus, a monk can give the 10 precepts of a sāmaṇera to someone who is less than twenty years old (and, a fortiori, more than twenty years old), but – did Buddha specify – who is at least fifteen years old. Then later on, some people complained to Buddha that their son, being younger than fifteen years old, although being mature enough for leading a monastic life, had not been accepted within his community. He then added a specification: a monk is allowed to give the precepts of a novice to a child being less than fifteen years old provided the later is able to frighten crows. As easy as pie. The vinaya does explain the procedure in details, giving all the formulas that it is convenient to express in Pali language. To sum it up: the one who wishes to become novice does express the request for it to a monk, than he shaves himself off, he removes his lay clothes, he dresses in a monastic robe, he "takes refuge" and takes the 10 precepts from a monk. Here we get a new novice! Hence, only the 10 precepts remain to be taken (see below). Remark: The laity wishing to observe the 5 or 8 precepts also takes the triple refuge. Each sāmaṇera is liable to observe 10 precepts and 75 sekhiyas. If a sāmaṇera breaks one of the first five among the 10 precepts, he looses his status of sāmaṇera until he takes back these 10 precepts from a bhikkhu. If he breaks one of the last five among the 10 precepts, he is subject to a punishment. To maintain the purity of the community of novices, in the same way as the monks do by listening to the presentation of the pātimokkha twice a month, monks give them back the 10 precepts during each full, new and half-moon (so nearly for times a month). Apart from the precepts and points of training into a blameless conduct, each novice is naturally liable to obey to instructions and recommendations given by more ancient novices and monks (provided the said instructions and recommendations are not abusive). He must also make himself subject to the various duties laid down in the monastery where he does dwell, including all marks of respect and points of duties towards his preceptors and instructors (the way it is described in the vinaya). 1 — To abstain from killing living beings. 2 — To abstain from taking what is not given. 3 — To abstain from non-noble sexual practices (no sexual practice is considered to be noble). 4 — To abstain from telling what is untrue. 5 — To abstain from drinking liquors causing states of drunkenness. 6 — To abstain from eating after twelve noon. 7 — To abstain from watching dance performances, listening songs, listening someone/people playing music, dancing, playing music – if it directly connected with the activities of dhamma, chanting is tolerated. 8 — To abstain from adorning himself with flowers, smearing himself with perfumes, wearing ornaments, utilising ointments. 9 — Refraining from installation in places higher than noble beings (bhikkhu, bhikkhunī or sāmaṇera, older than oneself), or reserved for such beings. 10 — To abstain from accepting gold or money.